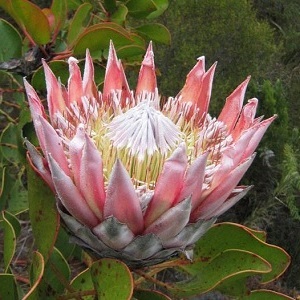 This is a wonderful and showy Protea, coming from the Cape Floral Kingdom in South Africa. The plant has green glossy leaves, and produces about 10 (sometimes many more) flowerheads a season, from June to September. King Proteas produce very big pale pink and silky flowers up to 30cm across. The flowers are long lasting on the plant and great as a cut flower. Plants grow to about 1m in height. Proteas are quite particular about their germination and growing conditions. They need a well drained sandy and acid soil with low phosphate levels. A sunny spot is best, which is sheltered against frost. King Proteas can be grown outdoors in a sheltered spot in the warmest parts of the UK, but otherwise best in pots that are overwintered in a well ventilated greenhouse. Pack of 8 seeds. Sow in autumn or spring. Seeds need to be soaked for 24hrs before sowing, preferably in a smoke primer solution. Flowering starts in years 4 and 5. Sowing instructions and a colour photo are printed on the packet. Sow in spring or autumn. Soak the seeds for 24 hours in warm water, using a smoke primer disc. After soaking, sow the seeds in a tray of moist well drained seed compost. Cover with 1cm of dry clean sand and keep at 15-18°C. Let temperatures drop at night. Germination takes 3-4 weeks, and up to 3 months in cooler conditions. Move the seedlings to pots when big enough to handle. Plant out in nutrient poor acidic sandy soil. Protect from frosts. Plants grow well in large pots in a well ventilated conservatory. Feed occasionally with phosphate-free fertilizer. Cut dead flower stems to ground level after flowering. Cut 1/3rd of woodier stems back to ground level after flowering. Frosted plants may recover when the weather improves by sending out new shoots from ground level. See Growing Advice for more information about growing Proteas.